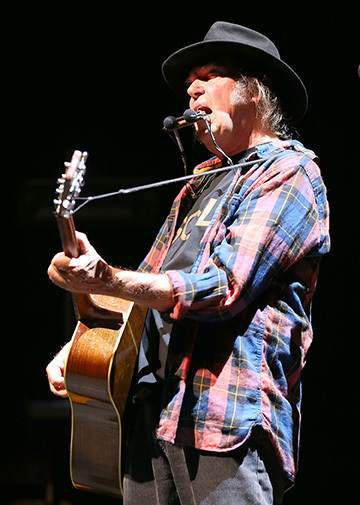 Following the long and winding road of his latest musical career path with the backing of Willie Nelson’s sons Lukas and Micah and their band Promise of the Real, Neil Young’s epic three hour show at a very sold out Greek Theater in Berkeley on Saturday night bridged the artist’s fifty year career with tracks ranging from Buffalo Springfield’s ‘Mr. Soul’ and CSNY’s ‘Helpless’ to the recently released “The Monsanto Years”. The thing is, these epic performances seem to be a regular occurrence on Young’s “Rebel Content” tour for the soon to be 70 year old Canadian who shows no signs of slowing down anytime soon. The three hour shows seem to be par for the course every night with a handful of different songs alternating within the structure of a setlist featuring a half dozen songs from “Monsanto”, an album that received mixed reviews but translated splendidly in a live setting with some beautiful vocals along with numerous guitar duels over the course of the evening with his new backing band that he first played with at last years Farm Aid, the brainchild of Young and his co-organizer Willie Nelson. The two-time Rock and Roll Hall of Fame inductee has delivered so many recognizable classics that he’d need to play for six hours to be able to even come close to not leaving out anyone’s favorite song. On this night gems like ‘From Hank to Hendrix’, ‘Harvest Moon’, ‘Alabama’, ‘Are You Ready for the Country’ and ‘Everybody Knows This Is Nowhere’ proved to be fan favorites, but it was a Herculean 15 minute plus crushing rendition of the Crazy Horse backed ‘Down By The River’ that thoroughly eliminated even the most remote possibility that anyone leave unhappy. no one left unhappy, just wondering which wondrous stories Young will return to share in the future.